It’s that time of year again, when we either give or receive plants as gifts and tirelessly try to keep them healthy throughout the year in hopes they may bloom once again. Because these plants are grown specifically for the holiday season, there are some tips and techniques you can use to keep them from ending up in the compost bin and looking beautiful year-round. The poinsettia, Euphorbia pulcherrima, is a popular potted plant at this time of year, providing color throughout the holiday season. Newer poinsettia cultivars are long-lasting in contrast to those available a few years ago. When purchased, poinsettias should be in prime condition, should be well shaped plants with dark green foliage and bracts free from defects. To care for Poinsettia, soil should be kept moist at all times, but not excessively wet. Water when the soil begins to feel dry and apply enough to the surface until it runs through the drainage hole. For best results, do not allow foliage to wilt between watering. 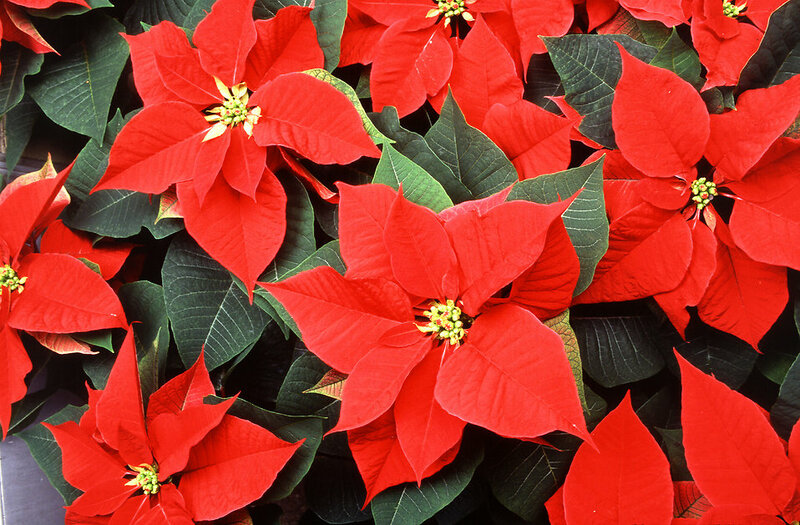 Keep poinsettias away from cold drafts and excessive heat, otherwise this may cause foliage and bracts to wilt from rapid water loss. Poinsettias are among the most difficult plants to re-bloom in the home. To learn more about propagating poinsettia and proper care for re-bloom next year, our fact sheet on “Care of Holiday Plants” includes more information on Christmas Cactus, Cyclamen and other blooming holiday plants available this time of year. Adapted from Resource The Selection, Care, and Use of Plants in the Home, by Charles C. Fischer and Raymond T. Fox, Cornell University, 1/90. This entry was posted in Uncategorized on December 14, 2017 by dmc72.